Prevent section editors from adding additional section editors to the section they have rights to. Currently, section editors can authorize additional "editors" who have not attended district training. In fact, the way the system currently works even our students and parents (who also have logins) could be granted editorial rights over a page by a section editor. This is a fairly substantial security flaw. Currently an app can be shared and used on other pages or pages of subsites. This is great until you have a page that has 10 shared apps on it that you want to share with 20 subsites. This now involves creating a page on each subsite, then adding each shared app one by one to the page. (this is 200 app adds for those keeping score). If you "copy" a page and then move it to a subsite, the apps do not stay shared, so that is not an option either. Allowing an entire page and all its apps to be shared as is would be great! Provide a simple way to copy and move an entire section including classic hierarchy navigation if being used. Example: I have a teacher with 40+ pages in her section, and classic hierarchy with 40+ links. This section needs to be copied and moved. With no easy way to copy and move the section, each page needs to be copied and moved individually, then each of the classic hierarchy links need to be created from scratch in the new location. Develop a way to allow the left navigation to be turned off for one page in a section. Currently you have to turn off the left nav for an entire section. I think this would be a nice feature that many would take advantage of. Android & Chrome for iOS do not automatically hotlink telephone numbers like Safari for iOS does. It would be great to have the ability in the TinyMCE editor to create telephone hotlinks. Currently, the only way to create a telephone hyperlink is via the source code. This is an impractical workaround because it will require district tech staff assistance. Section Editor Security - Allow Site Directors to restrict Users or Groups from being able to create new pages in Site Manager when setting them up as Section Editors. Have the Site Name we set under the Section options display on the left Navigation of a site and use the menu name for the directory view. ....or have an option to disable the title over the left name navigation. I can't resize photos or move them in NPE! In the New Page Experience, once I add a photo, I can't edit it. It won't allow me to grab it. Not matter what I try, double clicking, anything, it won't highlight the photo to resize or move it. So the only thing to do is delete everything and upload a new photo. The hope tab at the top left of Section or Channel Workspace should NOT go to the main website! Who would really ever want to navigate back to that from there? It makes no sense. You're probably expecting it to go to the Channel Workspace or Section Workspace you're working in's home area. Please, make that go to that section home. Make the page URL available with the editor window. Would be nice if we could somehow get the URL for the page we are working on within the editor window instead of having to save the page and then go back to the Summary tab, find the page and get the url. Add a Section Settings button so that Section Editors can configure their own sections, like changing Section name. When you copy a page with a shared app in the copied page the shared app is no longer shared but now a regular app that users can edits. This seems odd because I would expect a shared app to stay shared after it has been copied. On the discussion app, the section editor should be notified there are comments pending? Have the discussion app email the section editor when there are comments made. Make this an option in the app options. Another option would be to set a notification flag on the app page on the frontend so the section editor knows to go in and approve the comments. Many of our teachers travel within our district and may be in two or more schools. These teachers would like to have a web page for each school, but don't really need to have different content. It would be a nice feature if we could share sections similar to how we share apps. This would allow traveling teacher to have webpages on multiple subsites without the need to maintain 2 or more sections. In C1 the system bugged you to save your work, even if you already saved. This annoyed people but was helpful. C2 doesn't warn you at all so it went from one extreme to the other. It would be nice if the software was smart enough to know if you already saved or not and only prompted you IF you have NOT yet saved. We are hearing of many editors loosing their work because they didn't realize they didn't save before navigating away from the app they are editing. 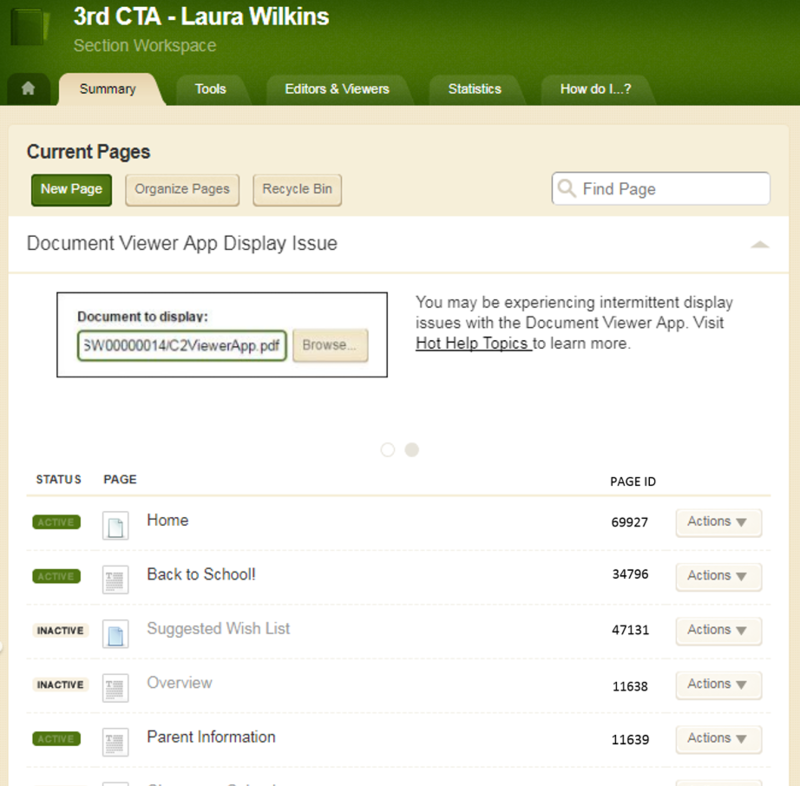 Add the ability to copy a section to another section on the same site or different subsite. Its weird to have to copy it and than move it to the section I want, because even after that I am not done. I than have to go to that section and rename it to get rid of the " - copy"
Is there a way that the developer could put in a Sort by Active under the Organize Pages area in the Section Workspace? We can Sort A-Z, but it would be great to be able to put the inactive pages at the bottom and not have them "cluttering up" the view. If there are no active pages within a section and the section does not map to a URL then the section should be automatically hidden from the end user. Currently a person is presented with a "You Don't Have Access to This Page" error message which is confusing to the end user.